Battery Hill is a centrally located, close to beach suburb and values here are only beginning to reflect the location and convenience of this excellent suburb. Comprising of 1207 properties, the greater of which are residential homes, there are 4 townhouse complexes and a small number of duplex units. From the suburbs central street, Crusader Street, you are 960 metres to the surf beach. The suburb was developed from the mid 1070’s and does not have the old fibro beach homes as many other suburbs. These homes are build from solid brick veneer, suitable for renovation if required. This office has sold homes in Anderson Street for well in excess of $1 million dollars. From the northern end of Battery Hill, you simply cross Nicklin Way to the Currimundi Markets and shops, including Woolworths and services. From the southern point of Battery Hill, you simply cross Cooroora Street to Caloundra Golf Club. This is an up and coming beach side suburb and presents excellent value and lifestyle opportunities. 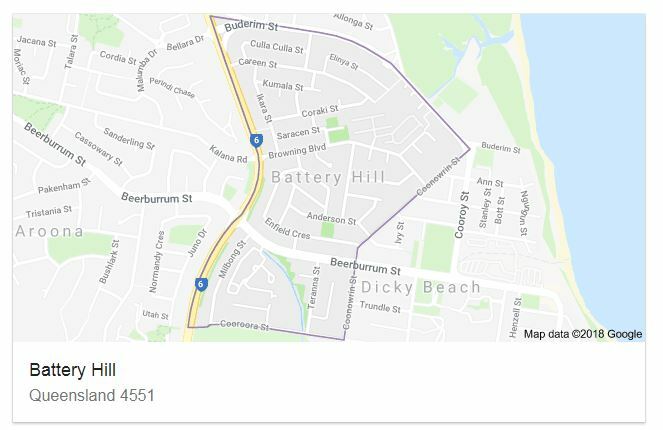 Main Battery Hill’s postcode is 4551, which it shares with Aroona, Bells Creek, Caloundra, Currimundi, Dicky Beach, Golden Beach, Kings Beach, Little Mountain, Meridan Plains, Moffat Beach, Pelican Waters and Shelly Beach. Schools – The closest state primary and secondary schools are Currimundi State School, Caloundra State School, and Caloundra State High School and Currumindi special school, it is also close to child care centres. Shops – Battery Hill is close to the major shopping centres in Caloundra. Can’t see any posts here? Your local property experts at David Millar Real Estate are ready to help. If you are looking to List or Rent out your property contact us today for your obligation free Market appraisal.